Beowulf is commonly known as the oldest surviving long poem in Old English, consisting of an impressive 3182 alliterative lines. And while such credentials translate to one of the most important works ever composed in Old English, there is no general consensus as to when this epic poem was actually composed, with dates ranging from 7th to 11th century AD (the original manuscript was possibly produced between 975 and 1025 AD). 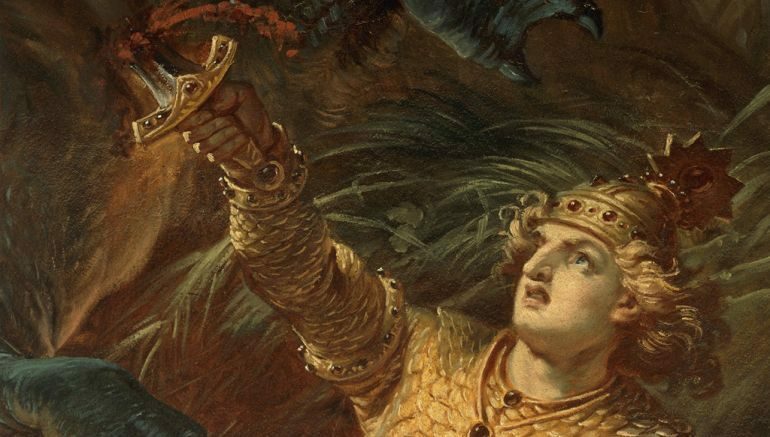 Now historically, while the clues about the original author of this epic work are lost to the whims of time, scholars do have some interesting data to work with – and that scope pertains to the usage of Old English in the poem. To that end, the very term ‘Old English’ in itself can be slightly misleading to modern speakers, since this language comprised a host of vocabulary derived directly from Anglo-Frisian or North Sea Germanic dialects, later sprinkled with some Latin, Norse, and Celtic influence. In essence, it was categorized as ‘English’ by virtue of it being spoken during the early middle ages in England, as opposed to some form of common English that present-day native speakers can ‘wholesomely’ relate to. Keeping that mind, one can hear the opening lines of Beowulf in the reconstruction by the Telegraph. Timeline wise, Old English was brought to the shores of Britain circa 5th century AD, by groups of Anglo-Saxon settlers who probably maintained contact with their Germanic kinsmen from the northern parts of continental Europe. To that end, some forms of Old English grammar is still quite similar to that of modern German, especially when it comes to nouns, adjectives, pronouns, and verbs. However at the same time, Modern English also does retain a few words from its ‘vague’ predecessor, with examples like Eald (meaning old), Brodor (meaning brother), Hus (meaning house), Riht (meaning right) and Munuc (meaning monk). Intriguingly enough, with so much talk about English and Britain, the poem of Beowulf is ironically set in the realms of Scandinavia, with the titular character projected as the hero of the Geats, a North Germanic tribe that inhabited Götaland, in southern Sweden. In that regard, there are various conjectures surrounding the origins of the poem, with one particular talking about how the literature was possibly composed by settlers of Geatish origins. Another interesting notion relates to how the epic poem was first composed in the 7th century at Rendlesham in East Anglia, and the region’s royal dynasty of Wuffingas may been descendants of the Geatish Wulfings. In any case, one can also listen to the bard version of the poem, as reconstructed by harpist and medieval scholar Benjamin Bagby, with the performance being ‘complemented’ by an Anglo-Saxon harp.